Featuring a subtly creepy performance by John Goodman, Dan Trachtenberg's 10 Cloverfield Lane is a remarkably simple yet effective psychological thriller swimming in a thick air of uneasy tension and a disturbing sense of uncertainty. The film takes shelter in the comfort of 4K Ultra HD wrapped in an excellent Dolby Vision HDR presentation and a demo-worthy Dolby Atmos soundtrack. Porting over the same supplements as the Blu-ray, the 4K package is recommended. An even stranger idea than making a sequel to Matt Reeves's 2008 Cloverfield is the concept that Dan Trachtenberg's 10 Cloverfield Lane is not, in fact, a sequel. Or at least, it's not in the traditional sense where the new script narratively expands upon the storyline established by its predecessor. 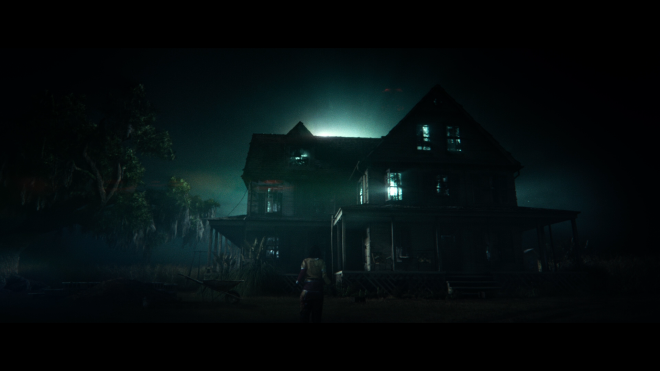 As marketed by the filmmakers — namely J.J. Abrams — Trachtenberg's psychological thriller is a spiritual successor, a term more commonly associated with the video game industry. It would be something akin to saying the film exists within a similar universe or shares a related theme, but that's not entirely true since this movie doesn't feature a ginormous monster attacking the city and it's also told in the traditional third-person narrative. Considering what Abrams and his Bad Robot production company were aiming for, perhaps it'd be better to say 10 Cloverfield Lane is the next episode in a film series with themes about surviving apocalyptic catastrophes. That would allow for the upcoming third installment to fit nicely with the franchise's theme. However, disregarding this somewhat weird anomaly trying to connect the two films, on its own, 10 Cloverfield Lane is a rather remarkable thriller set inside a doomsday bunker. For a good portion of the story, Trachtenberg keeps the audience questioning the motives of John Goodman's quick-tempered, oafish Howard and his account of a possible nuclear attack. 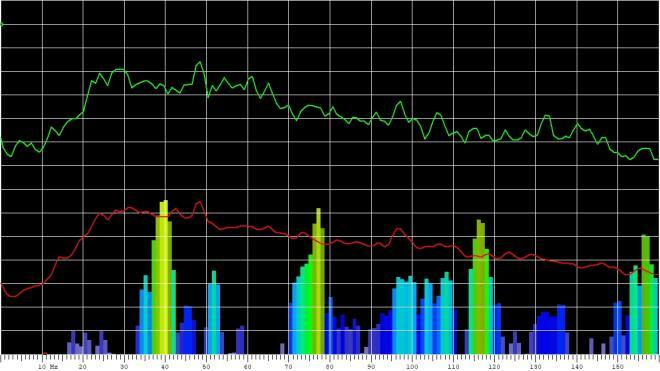 And this is in spite of John Gallagher Jr.'s Emmett confirming that some catastrophic event did occur. The difficulty in believing either of them comes from Mary Elizabeth Winstead's Michelle seeming as though she has been kidnapped and held against her will. Trachtenberg instills every interaction and conversation, from a simple dinner scene to a friendly board game, with a thick air of uneasy tension and disturbing sense of uncertainty. And through all this unceasing atmosphere of suspense, the promising director, making his feature-length debut, sticks to the theme of Michelle's habit of running away from uncomfortable situations, making the silliness of the final reveal tolerable and forgiving. For a more in-depth take on the movie, you can read our review of the Blu-ray SDR HERE. 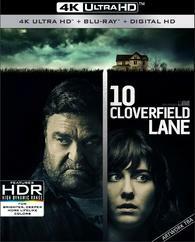 Paramount Home Entertainment brings 10 Cloverfield Lane to 4K Ultra HD Blu-ray as a two-disc combo pack with an UltraViolet Digital Copy, which can be redeemed via ParamountMovies.com or VUDU, giving users access to the 1080p HDX version only. Inside the black, eco-vortex case with glossy slipcover, the dual-layered UHD66 disc sits comfortably opposite a Region Free, BD50 copy. At startup, viewers are taken directly to a static screen with the usual selection along the bottom and music playing in the background. Surviving a worldwide attack from an unknown enemy inside a bunker with a creepy old man takes a turn for the better on Ultra HD, offering a welcomed, hospitable improvement over its predecessor. The HEVC H.265 encode in Dolby Vision HDR immediately displays outstanding contrast and brightness levels, which can be seen during Michelle's nighttime drive and stop at a gas station before the car accident. The lights glow a resplendent, brilliantly-bright white while maintaining excellent peak luminance and crispness, and specular highlights remain tight and uniform in the brightest areas, allowing for great detailing and providing a radiant, realistic shine along metallic edges. Much of this continues into the underground bunker, noticeable in a couple moments here and there, but it's not quite as dramatic, which has more to do with an intentionally creative style for effect than it does with the encode. However, rich, full-bodied blacks deliver dark, inky shadows that penetrate deep into the screen without completely engulfing the finer details. In a couple sequences, such as when Michelle crawls through the air ducts, they lose some of their luster, but on the whole, blacks are excellent, providing the 2.40:1 image with a lovely, cinematic appeal and depth. The psychological thriller also gains quite a bit in the color department when moving into the UHD neighborhood even though it doesn't quite carry the wow factor expected of the format. 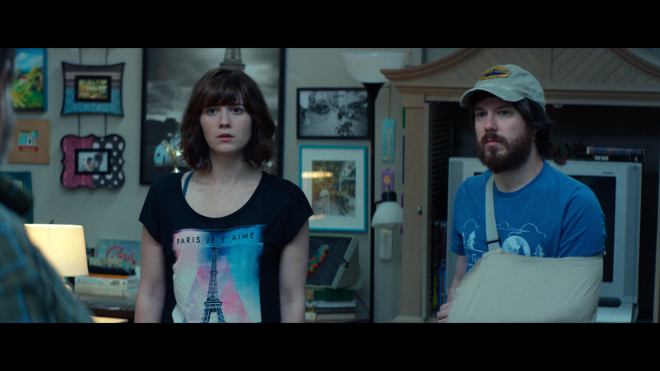 Similar to Cloverfield, the film comes with a particular design and deliberateness that keeps the overall palette in check. The orange-teal color scheme is made all the more apparent, making the hallway where Emmett sleeps glow in an oppressively depressing blue while Michele's room and the living room are bathed in the warmth of a homely yellow splendor. There is also a bit more variance in the softer secondary hues, allowing the pinks, violets, oranges and browns in the furniture and some of the clothing to really pop, and facial complexions appear healthy and accurate throughout. The few splatters of primaries are flamboyant and striking with reds in particular looking a richer, deeper shade than before. The movie was shot entirely on the Red Epic Dragon camera system, capable of up to 6K resolution, and the elements were later mastered to a 2K digital intermediate. There's little reason to believe producers sourced this 4K transfer from the original elements, but the movie nonetheless enjoys a welcomed uptick in terms of definition and sharpness. From hairs to the threading in clothing, fine lines are distinct and resolute. The tiny, individual fuzzballs of Howard's ugly 70s couch are clear, and smalls objects in the background decorating the bunker are plainly visible. Even from a distance, the lettering on the jukebox can almost be read, and viewers can make out every pore, wrinkle and negligible blemish on the faces. Nevertheless, a couple moments are not quite as detailed as others, the sharpest edges of some objects reveal the tiniest bit of aliasing and some sequences appear to suffer mildly from digital noise. Aside from those issues, which some may not even notice, the Dolby Vision presentation is terrific and a worthy step up. As they did with Cloverfield, Paramount recycles the same soundtrack enjoyed on the Blu-ray, but this Dolby Atmos mix remains an absolutely splendid listen. On the whole, the design is really more focused on character interaction and dialogue, but there are several moments when atmospherics employs the surrounds and ceiling channels, immersing the listener with a genuine sense of living inside an enclosed space. Some of the best moments utilizing the overheads are whenever characters hear the loud rumbling noise of vehicles traveling above them and when Michelle finally breaks free to discover an arguably worse nightmare waiting for her. I also want to note that the low-end is also one of the best available on home video. It's not quite the subwoofer-damaging terror heard in Cloverfield, but it's effective, robust and imposing nonetheless, digging down to 22Hz with a potent, earthquake-like grumble that will rattle walls and disturb neighbors (bass chart). For a more in-depth take on the audio quality, you can read our review of the standard Blu-ray HERE. All the same supplements are ported over from previous home video release, which can be read in more detail in our review of the standard Blu-ray HERE. Marketed as a spiritual successor to 2008's Cloverfield, Dan Trachtenberg's 10 Cloverfield Lane stands on its own as a remarkable psychological thriller set inside a doomsday shelter. With excellent performances from the three actors, particularly the subtly creepy John Goodman, the film swims in a muddy pond of mystery and a thick, suffocating air of apprehension where the audience is left wondering which is a worse fate: inside an underground bunker with a disturbed man or battling unknown horrors above ground. The film takes shelter in the comfort of Ultra HD with excellent 4K Dolby Vision presentation, making it a worthy upgrade, and the same demo-worthy, bass-heavy Dolby Atmos soundtrack enjoyed on the Blu-ray. Porting over the same set of supplements as well, the overall package is recommended for fans of the movie and those hungry for more HDR goodness.